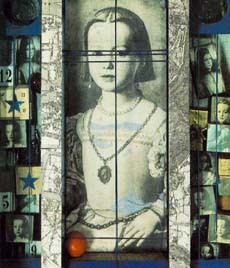 Joseph Cornell's nostalgic and magical work presaged Pop art; his influence on Andy Warhol and Robert Indiana cannot be overstated. He was born one hundred years ago this year. "Cornell's art occupies a special place between the spooky and the sappy, and it is the spookiness that gives the sappiness its power... He is an artist of longings... He didn't long to go to France, he longed to build memorials to the feeling of wanting to go to France... He preferred the ticket to the trip, the postcard to the place, the fragment to the whole... Warhol and Cornell worked from opposite ends of the emotional spectrum, indifference and infatuation, but they both ended in the realm of the Snow Queen. Warhol showed that it is possible to be truly in love with the frozen, Cornell that it is possible to be frozen in true love."